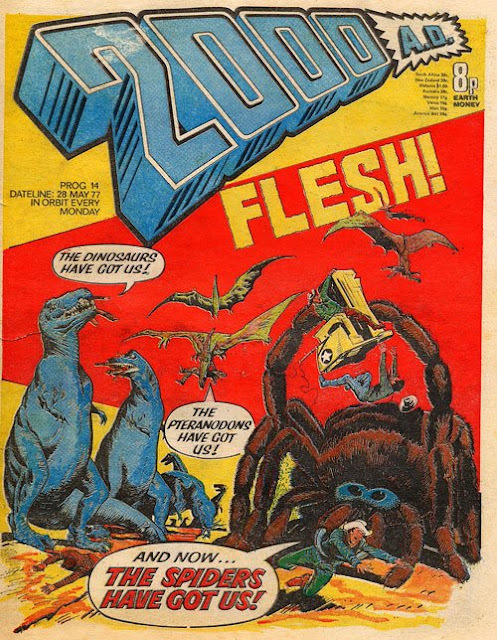 Cover: Yeah, I’m pretty sure Pteranodons are also Dinosaurs. 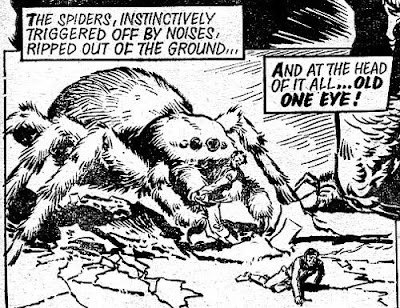 Also, I pray the spiders in the story aren’t actually that large. Following up from last week’s story, Bill, Silk, and the rest of the Mad Dogs are on their way to Doomsdale Nuclear Research Labs, where the Volgs are close to completing researching into… a Neutron Bomb! Bad futurism rears its head once more – while the threat of a nation developing a Neutron Bomb was horrifying to consider back in ’77, they wouldn’t take twenty years to produce. America basically had them by then, and even France was testing them by the early 80s. So it’s a little puzzling that the Volgs, the Commie Nazi villains of the strip, have taken an extra 20 years to sort out the finer details. As the Mad Dogs wait for the Canadian Para-Gliders to arrive and begin the assault, Savage hears a rustle in the bushes – it’s a spy! No, wait, it turns out to be just some guy. Savage wants to kill the man, but the Brigadier believes his stories of having been in the army, and lets him run off. I’m not sure why he does this – even if you believe that the guy isn’t a spy, why wouldn’t you keep him under wraps until the mission was over? Letting him run off just creates an opportunity to get everyone caught. Of course, that’s exactly what happens – although it’s because the guy was merely treacherous, rather than an actual spy. He runs to the Volgs and tells them about the impending attack (he apparently overheard everything! This is why you don’t want to speak too openly about your secret plans, even when actually executing them) giving the Volgs the chance to call in helicopters, who cut the Canadian troops to pieces before they make landfall. One of the paratroopers manages to damage a helicopter’s engine, and as it slowly decends Bill pops out from behind cover and blasts its pilot to death. With a shotgun. After the crash the Mad Dogs notice a Volg jeep driving up – the traitor and two officers have arrived to check out how many resistance troops were killed in the ambush. 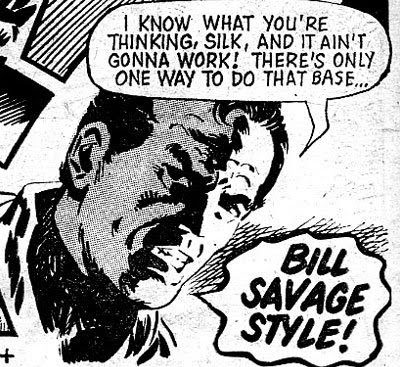 You know, as skeptical as I am of doing anything ‘Bill Savage Style’ (which, as I understand it, involves Fried Eels coated in mayo), he’s got a point here – it’s hard to imagine those uniforms would be much use after Savage pumped four shotgun rounds into the men wearing them. It seems that the Flesh Controller isn’t that concerned about the dinosaur siege as this week’s story opens. In fact, he’s got enough free time and resources that he’s able to execute some rangers for cowardice and desertion by tying their necks to hoverplanes and having the hoverplanes lift off. Earl Reagan protests the murder, pointing out that they need every possible man on the line, but the FC isn’t convinced. He’s so annoyed, in fact, that he has Earl and Joe thrown in the brig for questioning his authority. I know the FC is supposed to seem unreasonably evil here, but both men actulaly make valid arguments. Yes, you’d want as many people as possible shooting at the dinosaurs in a situation like this one, but having the guy next to you run off in the middle of a firefight is arguably more dangerous than not having a guy there in the first place, so having a severe and immediate punishment in place for desertion makes a lot of sense. 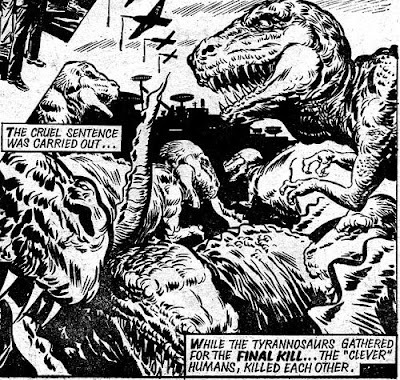 Yeah, that would be a lot more pointed if the flesh-eating dinosaurs hadn’t been constantly killing each other for basically no reason at all throughout the last ten issues. Also, I’m confused about the logistics of this siege – shouldn’t there be huge piles of laser-cut tyrannosaur corpses basically everywhere? Earl and Joe waste no time in escaping from their cell – actually, they do waste a little time talking about the pickle humanity has gotten itself into, but beyond that, it’s all escaping. They take the FC hostage and demand that he get some reinforcements from the future, but the FC is skeptical – after all, the dinosaurs have stopped attacking, haven’t they? The issue wraps up promising that the end is coming, including the final showdown between Earl Reagan and One-Eye! It seems that being down in points has driven the Heroes a little nuts, and in the very first panel of this issue, they’ve already resorted to cheating. Extremely vicious cheating, too – Chico putting a man in a necklock and then having Buck (a new Hero?) slam headfirst into his expoed chest seems more like the kind of thing a villain in this kind of a strip would do. After the half has been called the Heroes are down 6-0, a score that no team has ever come around to beat! Slim is arrogant and self-pitying, but Louis, the brain in a jar we haven’t seen in far too long, shows up to offer them a new strategy, one that he came up with using his disembodied brain powers! In a side note, is his nurse supposed to be a robot, or just really vacant? They fly into the air, ready to enact Louis’ mysterious plan. Hairy is skeptical, but Giant points out that, as a brain in a jar, Louis probably has magical powers they can’t even imagine! Which, to me, sounds like racial stereotyping. The plan? As far as I can tell, it boils down to ‘use the skill and improvisation that turned the original Harlem Globetrotters into living legends!’. Um… you guys knew that the original Harlem Globetrotters were putting a choreographed show, right? Okay, sure, they claim that they’re always playing a real game, and they lose once every thousand games or so, but come on. Anyhow, the scheme works, although suggesting that they play a quick dodging game rather than trying to match the the Scots brutality for brutality seems like it would have been clearer advice to get them to the same point. They tie things up just before the buzzer, and next week we’ll be in for sudden death, a 1 on 1 playoff to see who can score the first point! Luckily, the time distortions the ship was suffering from at the end of the last issue don’t tear everything apart, but the engineer does die a horrible death as he super-ages hundreds of years in a few minutes, finally crumbling to dust on the floor of the bridge. Also, everything he touches also super-ages for some reason. Everything but Dan Dare, who pushes him into a corner to die alone, and only suffers minor palm burns from the contact. After a narrowly avoiding an awkward situation in which Rok, the wolf-man offers to lick Dan’s wounds clean, they discover that the ship’s navigation system was also malfunctioning, and they’ve jumped into the outer rim of a sun! Unable to turn around, Dan worries that their heat shields won’t be able to take the 3000 degree temperature for long. Just then Rok spots a planet making a tight orbit actually inside the sun! Dan hurries to set down on it, although that doesn’t seem like the best choice – after all, won’t the whole planet be the same temperature as the space around the sun – the temperature that’s about to cook the ship? So, who wants to bet that the planet inside the sun is the Mekon’s secret base? No interesting letters this week, although I did notice the strange habit of Tharg seeming to refer to his race as Thargian. Guess they hadn’t thought up the Betelgeuse origin yet. It seems that the world of 1988 is undergoing a food shortage, and the only country with the crop science necessary to combat is China! So Probe sneaks in pretending to be a member of the national British ping-pong team! While breaking into the agricultural research centre, Probe wonders to himself why the great agricultural secret hasn’t been passed on to the rest of the world already. Um… because the Chinese have no legal duty to do so? In a world where nations are so competitive as to send hyperpowered men to invade one another, you could even make the argument that they don’t have an ethical obligation to do so, either. Probably a moral one, though. Depends just how starving the rest of the world is. After breaking into a safe and copying the formula, Probe finds himself face to face with Shang Chin, the genius biochemist who’s solved the world’s food crisis. 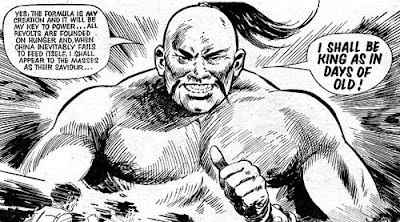 Also he’s an 8-foot tall super-powered Kung Fu man, who plans to use the secret of food growth to conquer the world! Probe finds himself unable to knock Shang down, and the Chinaman explains that he’s mastered the power of Ch’i – the force that mothers tap into when they have to lift cars off their children! Man, I wish I had come up with that analogy. Of course, what Shang doesn’t know is that Probe has also been given superpowers, only his come from science, rather than meditation. Unable to defeat Probe in combat, Shang immediately goes insane. Seriously, that’s how they wrap things up. Then it’s simply a matter of Probe flying away and giving the formula to the UN. Another happy ending for the MACH Man! I’m not sure who the artist is here (damn lack of credits! 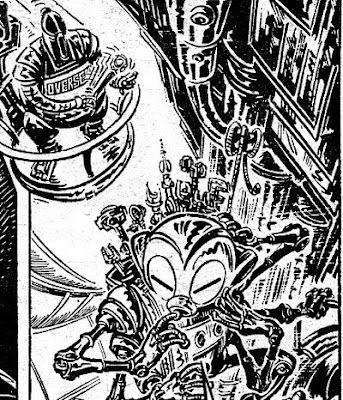 ), but I’ve got to say, the way these robots are drawn looks distinctly Ian Gibson-y. I swear there were guys just like this all over robo-hunter. Which I suppose we’ll discover together when we get to Robo-Hunter in I have no idea how many issues. 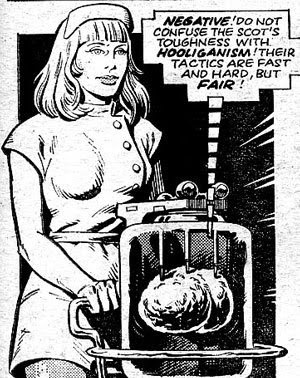 Finally Ken reveals the plan – they’re going to cut out Dredd’s brain and put it in an android copy of him! That way he’ll still look like Dredd, and have Dredd’s brain, but electrodes will cause him to follow all Ken’s orders at all times! For some reason they’re not ready to perform the operation just yet, so Dredd is shackled and taken away to wait until tomorrow. Eventually Walter arrives to serve Dredd some lunch, which turns out to be a cup of acid that he uses to melt the robo-cuffs, killing them! But how did Walter get there? It seems that older robots, ones that Ken didn’t actually build, are rankling under his autocratic rule, and are ready to help Dredd take the factory over! 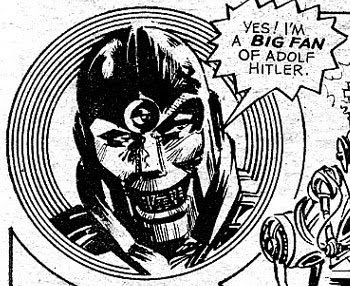 Best Story: Judge Dredd – He’s fighting a robot who patterns himself after Hitler and locks people up in sassy robo-cuffs. How could this not be the best story? Worst Story: Invasion - Much as I’m tempted to give this to HH once again, I’ve got to say that the killing off of all the Canadian troops in a single page ticked me off more than a little.